Smell the Fragrance of the Lord! OMG! (Oh My Goodness! ), I’m in Heaven!!! That’s what you will say when you smell these candles and rich lotions from Abba Anointing Oil. Burn a candle or two in your private prayer room and ascend into the heavenlies, surf the spirit, scuba the depths. Make the atmosphere of your time with Jesus last long after you are done as His scent lingers down the hallways and into every nook and cranny of your home. Can you smell Him? Can you even taste His presence? Can you feel the PEACE surround you and comfort you? That’s what has happened to people as they burn these Abba candles or apply some of the amazing Abba lotions. The candles are infused with high quality oils through the entire candle instead of being perfumed only on the outside. As the candle burns, the ‘heady’ aroma that allows you to quickly enter into His presence, doesn’t stop emitting that beautiful fragrance until the wick is no more. Speaking of wick time, the 3x4’s burn approximately 60 hours and the 6x9’s burn between 80 to 90 hours! That is a whole lot of ‘surf time’ in the spirit! My personal candle favorites are burning the Spikenard and Myrrh at the same time. OMG, I’m drooling just thinking about it! And the Myrrh lotion. It makes me feel beautiful and PAMPERED! You decide for yourself. Check them all out by putting the keywords of, ‘Candle’ and ‘lotion’ in the search box on our Bookstore website. Surf’s Up! 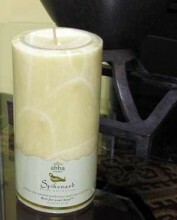 Enjoy the soft, sweet fragrance of Myrrh! This richly colored, deep purple candle is great for decorating and also for gift-giving. The elegant label conveys both the botanical and spiritual information on Myrrh, complete with scripture verse. We at ABBA call Spikenard "The Fragrance of the Bride", for it symbolizes the bride who has made herself ready, as is is written in Song of Sol 1:12 "While the king sits at his table, my spikenard sends forth it fragrance." The elegant label conveys both the botanical and spiritual information on Spikenard, complete with scripture verse. This exotically-fragrant long-burning pillar burns approx 90 hrs. ABBA's lotion offers carefully selected plant-based ingredients and the luxurious feel of genuine essential oils. It spreads easily and absorbs quickly, providing nourishment in abundance. It soothes dry, sensitive skin and adds plenty of moisture to keep the skin supple, healthy and youthful. This unique formulation of Soy, Jojoba, Coconut and Palm extracts in combination with Lavender Flower Water and Myrrh essential oil restores skin's natural balance for radiant health. The small bushy Myrrh trees grow high on coastal cliffs with little soil and flourish in extreme hot, arid climates. Harvested by hand in the very last days of fall, the gum resin flow is milky white, then it quickly turns a deep purple color with hints of white as it begins to crystallize. The fresh myrrh is packed in burlap sacks, then carried down the rocky paths to awaiting camel packs and on to local markets. Harvesters follow the Frankincense & Myrrh trails to market just as in ancient days.